When you need plenty of power, a Raspberry Pi might not be enough. 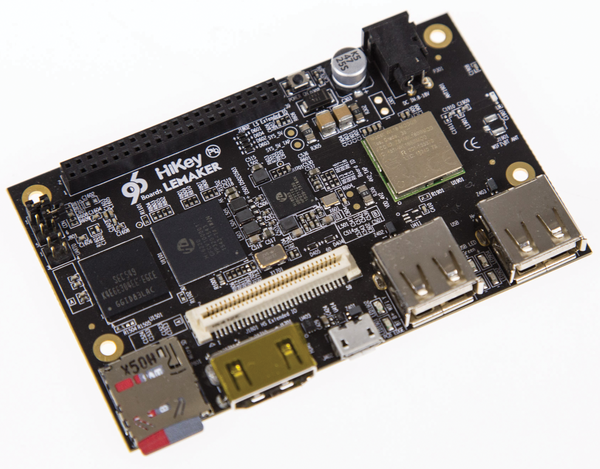 We tried our luck with a couple of souped-up single-board systems: the Banana Pi M3 and the LeMaker HiKey. The Raspberry Pi 3 (RPi3) is an able platform for multimedia and games, but faster alternatives exist if you're looking for real power. We decided to take a look at a pair of high-performing eight-core single-board systems: the Banana Pi M3 from Sinovoip and the LeMaker HiKey. The basic specifications are easy enough to see (Table 1), but a comparison of this sort has some pitfalls, so we started them up and ran some tests. Sinovoip and LeMaker have been at odds since 2015 as they compete for market dominance. The good news is that the consumer stands to benefit from this rivalry in the form of better prices, service, and software. The Banana Pi M3  is the latest model in the classic Banana Pi series (Figure 1). The M3 comes with the Allwinner A83T CPU, which has eight ARM Cortex A7 cores, each with a maximum clock rate of 2GHz. The working memory adds up to 2GB. An 8GB eMMC module serves as bulk storage. Alternatively, the operating system and data can be on a microSD card. The computer also has Gigabit Ethernet, 802.11b/g/n WiFi, Bluetooth, DSI, CSI, a SATA interface, two USB ports, a microphone, and much more. 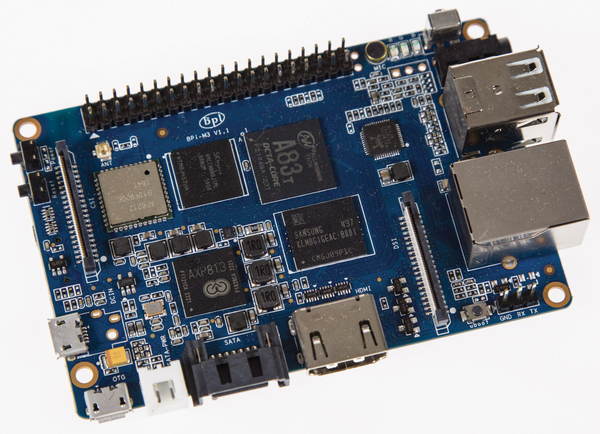 In spite of its extensive functionality, the board on the Banana Pi M3 is no larger than a Rasp Pi board. Figure 1: It is almost impossible to pick up a Banana Pi M3 without touching some type of jack. With all these capabilities, little is left to wish for, except to know which components in the Banana Pi work under which Linux. Sinovoip has made a large number of distributions available for the M3  but without any explicit recommendations. According to comments found in the official forum, all of these distributions work for at least basic functions. My first choice among the distributions was the uniquely named BPI Berryboot. It caught my attention, primarily because of its reference to w/GPU support, but then I read user comments that were less than encouraging. A genuine Ubuntu Maté seems to make more sense, but I would have to do without accelerated graphics. The user looking for a Banana distribution will search in vain. Even for the M2, the only thing that exists is an old Beta version, and not all the hardware works as desired. The system boots without any problems after it is installed on a microSD card. Internet access via Ethernet works smoothly, and configuring the WiFi function is likewise straightforward. Pre-installed programs include LibreOffice, Arduino IDE, and Iceweasel. I didn't encounter any problems running applications in parallel. An attempt to use the onboard mic was a flop. The Banana Pi 3 does not recognize a microphone. The SATA interface is also not very popular among users. It is connected via a USB connection, it shares a line with the hub, and it cannot be used for booting. Therefore I did not run a speed test. If you want a fast start, you are better advised to put the operating system on the eMMC memory . A well-functioning on/off button is a pleasing extra. I would like to see one of these as a standard feature for all single-board computers (SBCs). Unfortunately, the tiny little switch is inconveniently located, in that it sits near the likewise tiny reset button. The UFL connection for a WiFi antenna makes for a positive impression. Neither the LeMaker HiKey nor the RPi3 offer this feature. The LeMaker HiKey  distinguishes itself from the Banana Pi M3 starting with its optics (Figure 2). The design did not actually originate with LeMaker. Instead, the sizes for the board and the connections were derived from the specifications provided by the 96Boards group , an association that tries to establish industry-standards-related hardware and software for embedded ARM computers. This effort to align with industry standards means HiKey shares commonalities with professional devices instead of the classic hobby computer. Figure 2: Except for the power connection, all of the connections on the LeMaker HiKey are found on one side of the board. An 8GB eMMC module serves as bulk storage. We used the eMMC module during testing. Alternatively, you will find a slot for microSD cards. Peripheral devices connect via two USB 2.0 ports and Bluetooth, and you will find an interface for micro-USB OTG. The HiKey transmits video and audio signals via HDMI. Internet connections are established exclusively via WiFi. The power supply requires a 12V adapter with a suitable plug. The HiKey comes with two pin strips for hobbyists. The 40-pin version for GPIO contacts and various bus systems is not compatible with a Rasp Pi, in spite of the identical number of pins. You will also find a 60-pole jack socket, which also has bus systems, a camera, and a display connection (CSI, DSI). However, the jack socket requires a breakout board. Both pin strips are compatible with the standards established by 96Boards. As a result, so-called mezzanine attachments  are available with additional sensors and connections. Only a few operating systems support the LeMaker HiKey. LeMaker has left this matter entirely up to the 96Boards group. Offerings include an Android version and the Linaro distribution. During our tests, we settled on Linaro. Although the changelog mentions the missing audio output, the Linaro developers are completely silent regarding accelerated graphics and video for the embedded Mali 450 GPU. Linaro is generally an unremarkable Linux distribution, with the exception that it is based on the AArch64 branch and therefore is a 64-bit system. This 64-bit support can offer performance benefits, but it can also lead to difficulties with some programs. The shortage of available operating systems means a user who wants to use the Handle to Registry Key (HKEY) as a media center or a gaming platform will have to look to Android.